Hello, people of the world and people of my life (not necessarily in that order)! It’s the end of the year, and something is happening to me that feels really wrong. I have the urge to write one of those year-end wrap-it-up newsletters!! And I know that 54.9% of people polled hate to read them! To be fair, though, something is wrong with you, too, because studies show that there is a 77.7% chance that you will read it if I write it. IF!! The fact is, you already know what I’ve been doing this year professionally and – sort of – personally, because my life and art are so blended and I report whatever I can remember about my creative ventures in these pan-sexual, I mean bi-monthy newsletters. I am also pleased to report that A Concentration of Power is on view at the Joost van den Bergh Gallery in St. James, Piccadilly in London and will remain there thru January 31. My Underpants of Many Colors are in very distinguished company in this thoughtful/playful group show of art and historical artifacts curated by my pal, artist Alexander Gorlizki. I just spent a thrilling week in Portland, Oregon, setting the stage (all puns intended!) for my latest design collaboration there with the awe-inspiring, tear-inducing, karaoke-singing, ground-breaking theater company Hand2Mouth. Dream|Logic opens February 23, 2019 at Alberta Abbey. It is a fully immersive piece using the language of local Portland teens to create a completely unique experience for ALL AGES. We’re talking about walking, everybody! The audience will go through the weird and stimulating overlooked areas in Alberta Abby’s historic building to experience adventure, growth, beauty (I hope), and entertainment (guaranteed!). It turns out that February is Oregon month for me! At the time of the opening of Dream|Logic I’ll be spending the month 3,500 feet above sea level in the Cascade Mountain Range in central Oregon in residence at the Caldera Arts Center! 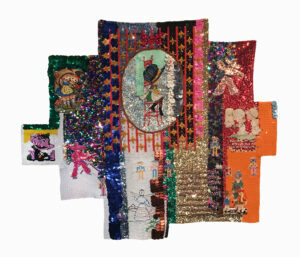 I plan to spend my time there creating more Then and Now sequin items, adapting the script for my play Who or What I Am to be better suited for touring and submission for festivals, and creating a very special site-specific performance to be staged at the RISD Museum in the Spring in conjunction with the Repair and Design Futures. Ugh, Art! 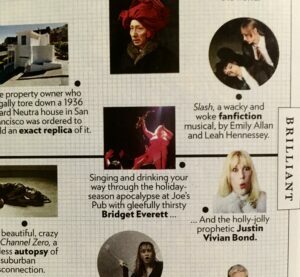 Yawn, boring. How about some high fashion House of Larréon news?? and the creation of her newest gown, “Beaver Deep, Mountains High” that got the ball rolling, so to speak. 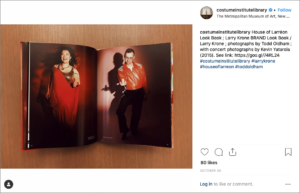 Or perhaps it was the Metropolitan Museum of Art Costume Institute’s Irene Lewisohn Costume Reference Library‘s acquisition of LOOK BOOK and their posting on Instagram of three of its elegant spreads featuring photographs by Todd Oldham that drew all of the new couture clientele. Who knows? But I’ll take it all! The Times was too shy to include the actual name of the gown, but that didn’t stop Bridget from mopping the Joe’s Pub stage with it during Bridget Everett and the Tender Moments’ Winter run and Murray Hill’s A Murray Little Christmas shows there, and the world via social media and even New York Magazine’s Approval Matrix which has her teetering just above the lowbrow border. If you would care to visit the SHOP, you will find, sadly, that our hottest seller of the season, Dr. Larreonstein’s patchwork ski hats, are temporarily out of stock. 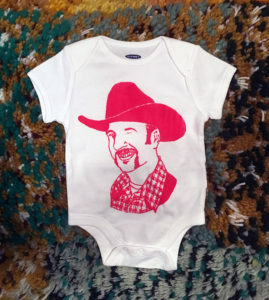 BUT we still have a scarf or 2, a handful of beautiful handmade patchwork neckties, a bunch of t-shirts, and a new crop of a very special adorable item, my hand-screened, Larry Krone face ONESIES!! Uh oh- onesies make me think of babies, babies make me think of families, and families make me think of year-end wrap-it-up newsletters! Here it comes. I’ll keep it brief. 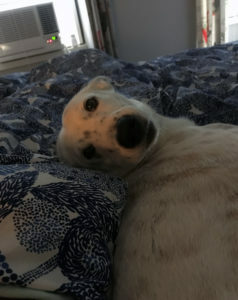 Her name is Dory Lee Linda Andralis Krone, she is a rescue from Puerto Rico, and she is a (delightful, adorable, loving) handful. In other animal husbandry news (that’s what that means, right? ), Jim’s band Jim Andralis and the Syntonics is doing great and is creating the most beautiful music available! And now I can officially announce that my honorary trial as a featured member was a success, and I have graduated to become AN ACTUAL SYNTONIC!!! OURsecond album “Shut Up Shut Up” was released in a glorious concert at Joe’s Pub on January 26th, and we’re now recording a new album and rehearsing for a concert March 25th at that same old dump which is actually the greatest place in New York, Joe’s Pub. OK, briefer: My sisters & brothers – and in-laws, too! – Janet & Randy Kennedy and David & Amy McFeeters-Krone, Kori & Chad Erceg and their families are all doing great and super-achieving to a sickening degree. Books are being published (Randy’s Presidio & Ursula: Issue 1), TV and other media appearances are getting made (Janet’s Sleep Doctor stuff), David is doing a bewildering whatever he does with something having to do with licensing and technologies, a new Real Estate career just got started (Amy), an established one keeps getting better (Kori), and a delicately balanced life of financial planning/craft beer connoisseurship gets hoppier by the minute (Chad), not to mention a bunch of kids (Guy, Abby, Grant, Rachel, Anna, Sophia, Leo, and Iris) who are going berserk with their brains and bodies as only young folk can do: rowing, band, twirling, college, guitar ensemble, Bat Mitzvah preparations, forensic biology, art, baseball, fashion! Are you grossed out yet? That passage ended up being less ironic than I’d planned, so I’m sorry. It’s true, everybody! Happy New Year!! 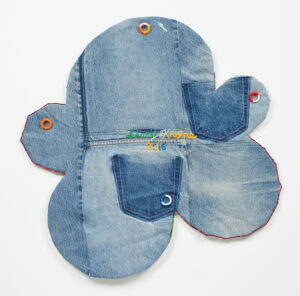 By the way, this site was designed and made by Matt Fisher. Don’t you want one like it? Hire him! !